Landmark's Century Centre Cinema recently joined the midnight-movie craze. So far, the programming has featured some usual suspects (Raiders of the Lost Ark, The Goonies), but some more inspired offerings include Fargo and, most recently (as in, just a few hours ago), The Good, the Bad, and the Ugly, Sergio Leone's classic spaghetti western. The film strikes me as ideal midnight programming (despite its lengthy running time, which kept moviegoers out past three in the morning) because of its status as both a genre classic and a formally advanced piece of bravura filmmaking—in other words, it's great fun. The screening got me thinking of spaghetti westerns, an early obsession of mine. You can check out my five favorites after the jump. 5. Sabata (Gianfranco Parolini, 1969) This capricious actioner is perhaps the most acrobatic spaghetti western you're likely to see. Virtually every action sequence in the film involves explosions, as well as characters hurled through the air as a result of said explosions. The incessant movement of bodies through space gives the film an energetic tone akin to kung fu. Things move so quickly that Parolini can barely keep up with the narrative, which is flimsy at best. However, action and form this kinetic, measured, and flamboyant will always trump poor storytelling. 4. Keoma (Enzo Castellari, 1976) This mystic, referential mood piece emerged as the genre was dying down, incorporating themes of familial betrayal and human deprivation. Franco Nero, the Marlon Brando of spaghetti westerns, stars as the titular Keoma, the son of an Indian mother and white father who returns to his hometown after the Civil War, only to learn that a plaguelike disease has ravaged the population and that those infected are being quarantined in an abandoned mine. Filming mostly at night, Castellari utilized the natural light provided by lit torches, which gives the film a velvety, almost medieval look well suited to its Shakespearean aspirations. 3. Four of the Apocalypse (Lucio Fulci, 1975) Though he's mostly known for his horror fare (The Beyond, Zombie), Fulci directed films in a number of genres, including three westerns. Four of the Apocalypse is something of a transitional film for him; it came at the tail end of his prolific string of giallos and crimes dramas but predates his "gore" phase. Consequently, the film finds Fulci tinkering with his pet themes, including misappropriated masculinity and unrealistic, phantasmagorical settings. An interesting factoid: Fulci's Silver Saddle (1978) is widely considered the last true spaghetti western. 2. Django (Sergio Corbucci, 1967) Though it's now famous for inspiring the latest Quentin Tarantino movie, this seminal film is every bit the equal of Leone's best work. Surrealistic, gritty, and ardently political, the film ushered in a new conceptualization of westerns. The hero Django (played, of course, by Nero) does battle against a group of foes clearly modeled after the KKK, only their white hoods are changed to red and racist fervor is replaced with religious zealotry. The film presents a bizarro version of the American west, a demented fun-house rendition of what was formerly considered a stately genre. 1. 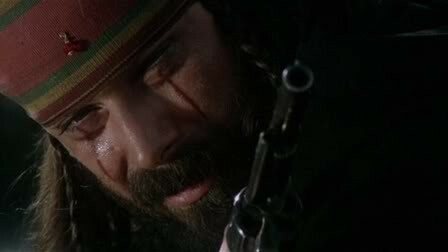 For a Few Dollars More (Sergio Leone 1965) The second installment of Leone's trilogy, and, as J.R. Jones notes in his review, the first in which he'd display his signature visual touch: extreme closeups of a character's eyes, usually juxtaposed against an extreme long shot. Few directors understood the complementary elements of music, form, and montage as well as Leone, who ratchets up the tension here with fascinating ease. In a bit role, Klaus Kinski makes an appearance, which is never, ever a bad thing. Honorable mentions: Corbucci's Companeros, a prime example of a Zapata western (sort of a Mexican offshoot of the spaghetti western) features some of my favorite sequences of his, and Antonio Margheretti's western-kung fu mashup The Stranger and the Gunfighter is good fun. José Luis Merino's Requiem for a Gringo, which you can occasionally find bootleg copies of on eBay, is absolutely bonkers, one of the strangest films I've ever seen, spaghetti western or otherwise.